All main gear tyres on an Ilyushin 76 cargo plane burst upon landing because the parking brake was inadvertently engaged prior to landing, according to UAE investigators. On June 21, 2012, an Air Trast Ilyushin 76TD was involved in a serious landing accident at Dubai World Central-Al Maktoum International Airport (DWC), United Arab Emirates. 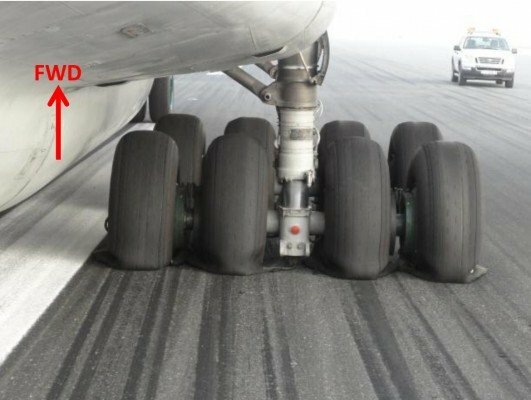 All sixteen main gear tyres burst due to skid caused by brakes jamming at landing. There were no injuries. The airplane operated on a cargo flight from Kandahar Airport (KDH), Afghanistan. (c) The CRM was not sufficient to detect and prevent the parking brake switch commission error. (a) Although the parking brake system could have detected the inflight parking brake engagement through the green brake lights, the system was not designed to prevent the in-flight engagement of the parking brake. (b) The communication network among the flight deck crew was not sufficient.